Native to western Africa, from Cameroon west to Sierra Leone. Makes a stunning indoor tree. Easy to grow. Provide morning sun or bright, indirect light. The starter plant you will receive is growing in a 4" pot average size is 4 inches tall some maybe taller. Ficus lyrata, commonly known as the fiddle-leaf fig, is a species of fig tree, native to western Africa, from Cameroon west to Sierra Leone. It grows in lowland tropical rainforest. 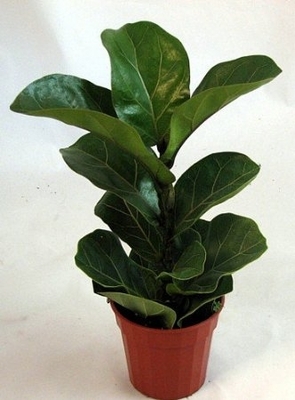 As a house plant the Fiddleleaf Fig is very easy to grow. Provide morning sun or very bright indirect light and keep evenly moist, not wet or dry. Trim as needed. Cultivation and uses It is a popular ornamental tree in subtropical and tropical gardens, and is also grown as a houseplant, where it usually stays shorter when put into pots than when grown outdoors. Their main horticultural feature are their large leaves. Like other fig species, it can grow to a large tree if planted in the ground. Like all figs, it is frost tender. The starter plant you will receive is growing in a 4" pot. Please allow 2-4 weeks for this item to ship out.